Since all I wanted was to show two different temperatures, the circuit is very simple. 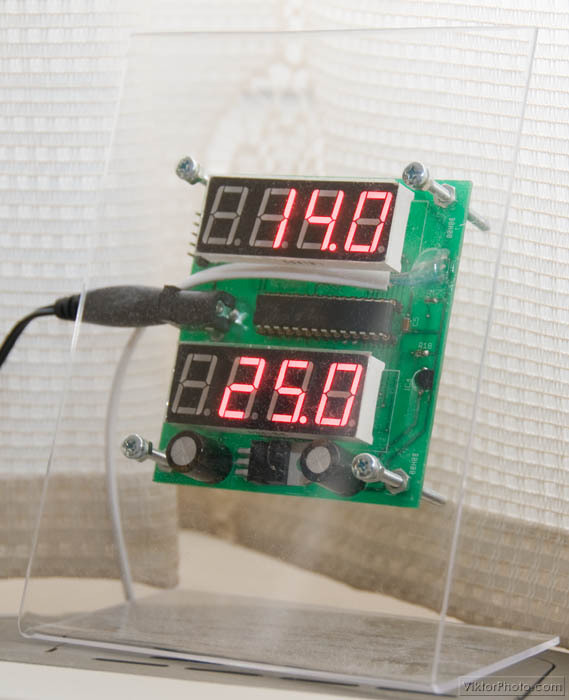 It contains the temperature sensors, the display modules and a microcontroller to manage some simple tasks. The microcontroller of choice was a PIC16F886 because I had used it for some experiments and wanted to build it into something. It has all the functions I needed, e.g. 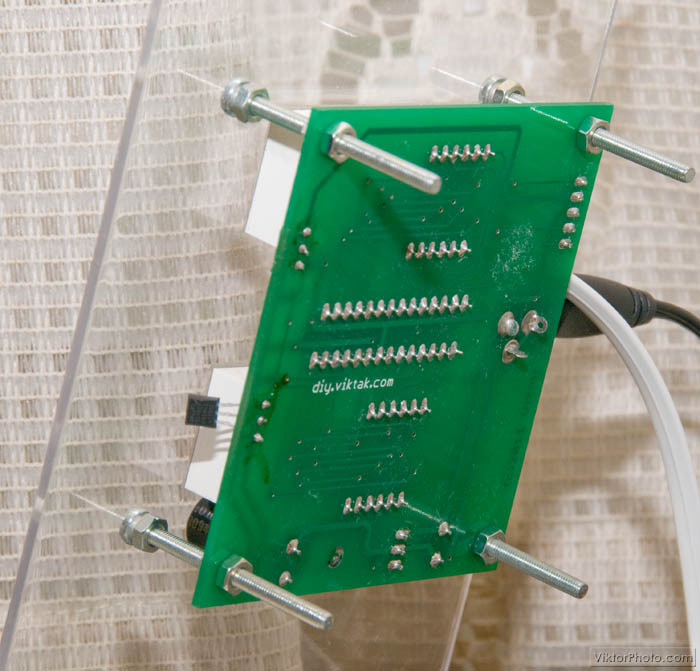 an internal oscillator to cut down on external parts needed, a timer for refreshing the display, enough digital I/O lines for connecting to two display modules without extra hardware. The display modules are some common cathode 4 digit 7 segment ones. The advantage of these common cathode (or anode) modules is that they use less microcontroller I/O lines then ordinary 7 segment modules. The drawback is that the software is a little more complex since the displayed values must constantly be refreshed. At any given time there is only one digit displayed, all the others are off. Displaying 8 digits for 1ms each means that refreshing rate is about 8ms, or 125Hz. This is fast enough for the human eye to not see separate digits flashing but a constant set of characters. The temperature sensing part I used for this project is a high-precision 1-Wire digital thermometer chip from Dallas Semiconductors. There are a number of similar ones available; I used the DS1820 because I have a few of them left over from previous projects. This one uses the 1-Wire protocol to communicate with the PIC, doesn’t need any external components and it’s easy to be placed inside a fridge. The 1-Wire protocol allows many 1-Wire devices to use the same data line but the software overhead is so high (at least in assembly) that I decided to use two separate lines for the two thermometers. This is not the most elegant thing to do but I didn’t find any assembly code on the internet I could steal borrow. Having two 1-Wire lines made my code a lot longer than it could be but this time I had plenty of program memory in the PIC. This chip provides the results of the measurements in Celsius format. Of course, a mandatory ICSP header is also included on the board, just in case. I tend to use as many SMD parts as I can to save on PCB size and make it look nicer. This time, however, the PIC I used is a TTH version because I had that already and wanted to use it up. After connecting the circuit to power (>7.5VDC, a 7805 regulator is on board) first it does a display test for a few seconds then it starts normal operation. Temperature is measured about once per second. At the moment the resolution of the temperature displayed is 0.5C. This can be further refined from software. I might do it in the future, but for now I am eager to get it in the fridge and the living room. This time I decided to put the PCB behind a modified transparent photograph holder which I got for about half a euro in the local stationery store: First I cut off the rear part of the plexiglass (that normally would hold the photograph against the front one), then I drilled 4 holes into the front one and with the help of some long screws I mounted the circuit behind it. 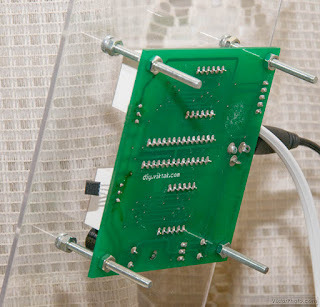 Here you can see easily how I mounted the PCB on the back of the clear plexiglass. Do you plan to publish the software source code? @Anonymous: I'm afraid I won't put the code on the site but if you send me a private mail I will send it to you. I would like to see the code to, i have a project with I-button and a PIC32 going on. Vitya, how is DS1820 and the wiring holding up in the fridge so far? I mean, it's a pretty humid place, how did you seal it? I'm thinking of building a similar device where I would need to see the temperature difference between the inside the house and outside (an experiment having to do with the house insulation). How far from the PIC the DS1820 can be located, do you know? And I also need to ask about the code: will you make it available at some point in the future? I will definitely need to make changes because I would need it to show not only the two temperatures but also the difference between them (so I don't have to carry a calculator around). @ElectroNick: The cable I am using is about 2 meters - I don't know the limit, but it's much longer than if I used a sensor with analog output. Can you send the source code n hex file for this project to my email: yeeboon1115@hotmail.com. Thanks. Nice project! What is the temperature range? It looks very well. I see some ports are free. You can put a little buzzer to have an alarm when door fridge is opened too long. I see somewhere on net an ideea to put an photoresistor an measure the time of how long the light is on. Yes, there are some IOs left for custom use. I didn't use them because I don't need anything else - my fridge already beeps if it is left open for too long :) It is indeed possible to expand on this. If you do so please let us know here with a short description and a photo of it. I sent you the code in private mail. Nice project! hanks fo sharing - very pretty! Nice! Please send me hex file on my email alcor75@mail.ru. I work in basic, but I would be interested in studying your code and how you communicate with the DS1820. You know that all us tech-people love the thermostat you put together. It might look crude to the average person, but i think it is a beauty. Could I please see the source code? Thanks for the encouraging words! I just sent you the sources in a private mail. One more thing: Just this afternoon I found a bug in the code - it doesn't handle negative values properly. I will probably fix it tomorrow or so. May I ask if you have completed the portion for hte negative values? If you are also able to email me the hex and source, that would be terrific. Btw, I did have to make the image greyscale just so that I could read it on the monitor without straining my eyes to much. Maybe different colours next time? Just a thought. Please let me know your e-mail address so that I can send you the code. I don't know about the problem with the colours - no one else has reported a problem so far. Did you click on them and have a look at them in higher resolution? Thank you for your suggestion. I had downloaded the image and viewed it at 1920*1080, but that pinkish background and other colour combinations just made it harder. I ended up printing it, and it was much better. 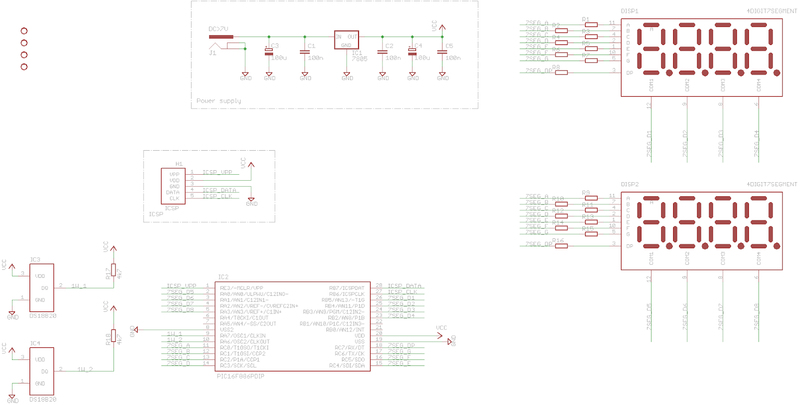 Also, I am curious about the PIC durability, since it is only made for 25mA per outpout pin, and I did not see any transistors that I had seen in so many other projects on the net when using 7segment multiplex :-) What is the mAh draw per output? Just thinking for when it will have to display "8". If you could email me the source and hex, that would be great. I haven't done assembly since I was in school, oh sum, um nearly 25 years ago, hehe. I am much more comfortable with "basic". C1, C2, and C5 are on the component side, they are just visible on the photo. The displays work in a way that only one segment is lit up at a time. The timing is such that each digit is on for a few milliseconds, then off for many milliseconds. The average current is calculated like this: let’s say 10mA per segment, so max 80mA consumption when all the segments are on. There are 8 digits in total, so one digit is lit up for a bit for about 12 % of the time, so the average current is about 80mA * .12 = 9.6mA, which is well within our PIC’s range. Is your code written in C or in assembler? HEX code sent in private mail. Hi, I'm also interested in the sources...can you send it to me? Very interesting stuff. Would it be possible for you to send me the code also? As I am learning assembly it would be a great source code to learn from. this looks great, I'm about to build something similar to try to monitor temperatures on my truck. It would help me a lot if I could see your code - would it be possible to let me have a copy please? thank you for sharing this nice project and for mailing me the hex code! 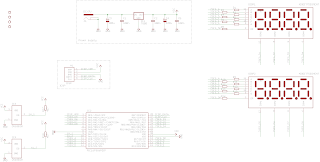 I`m in a process of drawing the schematic in Eagle, and I`m missing the value of the segment resistors. Thanks in advance for your answer, and keep up with great work! I used some values around 150-180 ohm, but it really depends on the LED modules you use. OK. I`l do some tests prior to soldering. Thank you for answering. Thank you. Code sent in private mail. Please share source code,I would like to build and test. Brilliant job. Please could you send me the code? gummibear1986@googlemail.com. What is the reason for using separate resistors for each display segments instead of using only one per segment, as the segments are driven by the same pin? I'm not sure if I understand your question correctly (each segment vs. per segment) but I need separate resistors for each segment of each digit as not all the segments exhibit the same characteristics, i.e. the decimal point is one LED (internally) the other segments are two LEDs (internally). If I use the same resistor value across all of the segments the decimal point will be visibly fainter than the rest of the segments. Hm, I didn`t know there are 2 LEDs per segment compared to one LED per decimal point, but still... couldn`t both displays segment A use same resistor and and both display DP use same resistor with other value? I`m asking because I want to make the PCB as small as possible. If R1 and R9 are 150R wouldn`t it be the same if both segments are fed trough one 300R resistor instead? Ah, yes, I see what you mean and you are right, you can get rid of one set of resistors, but you shouldn't change the resistor values as at any given time there is only one digit is lit up. OK, thanks for the quick response, and good luck with your projects! Hi, You have made very good job. 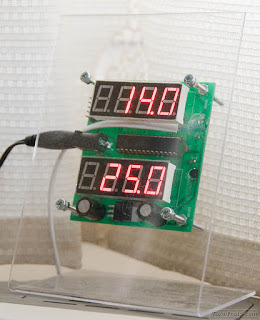 Your project interested me and I want build thermometer too. Is possible to send me code on email uvevax @ gmail.com ? Nice project. I would like to try it myself.